Each night, Uncle Charlie the Field Mouse tells the little field mice who are yet too young to work in the fields of the wonderful corn concerts and the beautiful Song of the Corn, as they sit by Aunt Beatrice Mouse's fireside before bedtime. He sings in his beautiful Irish Tenor Voice, the Song that Autumn Corn sings to the grown mice after their day of gathering the scraps from the farmer's field. He tells the little mice that they, too, will someday work in the fields and hear the beautiful rustling of the fall cornstalks- this lovely singing of the corn which from time immemorial the field mice have called the Corn Concert. The little mice dream of the day when they will hear the lovely Song of the Corn at the Corn Concert. Then one day, rumors begin to circulate of a big change coming to the farm. Ominous whisperings frighten Aunt Beatrice and Uncle Charlie. They try to keep talk of something new called a strip-mall, and the possible sale of the farm from the ears of the little mice. Could the beautiful way of life the farmer, his family, the farm animals and the field mice have known and loved be coming to an end? What is to become of them all? The animals gather together and cooperate like never before, and try to decide what to do, as the familiar singing of the corn fills the autumn air. This book for children (big and small, young and old) I hope has a lot to teach us all about love for the arts, and their importance in our lives. As well, a concern for the environment is stressed in this story, as there shall be no more beautiful earth for artists to create upon if we continue to cover it with strip malls, if we gobble up our precious farm and forest lands, and if we pollute our environment. I believe the little field mice in our story have a lot to teach us, for we are not so different from them. We all, human and animal alike, depend upon our Mother Earth for sustenance; and we would miss, more than we know, our beautiful way of life here on our planet, which we often take for granted, should it suddenly change or cease to exist as we know it. We can learn a lot from little mice. 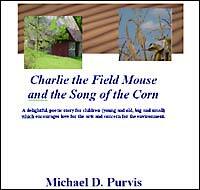 And now, please enjoy "Charlie the Field Mouse and the Song of the Corn." Every year, as the wheel of the seasons turned, Charlie the field mouse and his clan of field mice especially loved autumn. It wasn't just that the farmer would leave behind all sorts of bits for the mice to gather when he harvested his field, though this was wonderful and essential for the mice. It was more than this. It was the anticipation of what came after each day of gathering for the field mice! And what was this wondrous thing that the mice anticipated after each day's work of gathering the scraps and tidbits left by the farmer in his field? 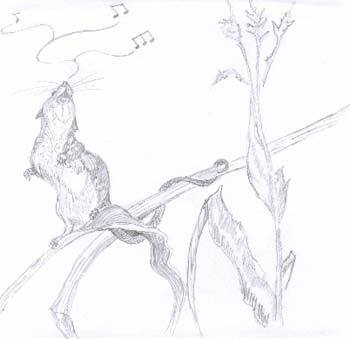 Every autumn evening, after a full day of gathering for the winter, Charlie and his brother and sister mice would sit at the edge of the field and listen to a concert. And who gave this concert that the mice so loved to listen to at the end of their day of gathering? It was the corn! The concert consisted of the beautiful rustling of the fall cornstalks, the lovely singing of the corn, which from time immemorial the field mice have called the Corn Concert. 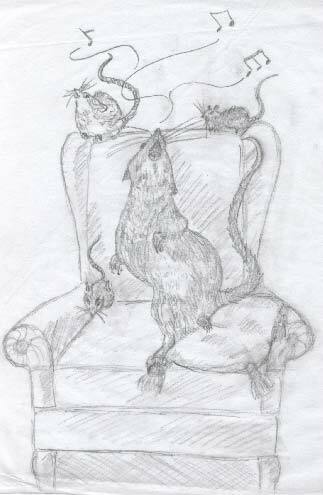 And after this daily concert, it was home to their burrows for the adult mice for supper and tea, and the all-important job of tucking the littlest field mice into bed. These little mice were too small to gather the scraps and tidbits in the farmer's field, and too small to go to the delightful corn concerts. But they loved to hear about the gathering, and especially the concerts! They dreamed that someday they too would be big and strong and take part in all the mysterious and exciting things the adult mice did. But for the time being they had to settle for hearing about the gathering and the corn concerts each night before being tucked into bed. It was a sort of ritual, like a bedtime story, this recounting of the days gathering and of course the wondrous corn concert. All of the adult mice told of these things to their little ones, but none were as adept and as good at this duty as Charlie the Field Mouse. He was known as "Uncle Charlie" to the little mice in the household of Beatrice Field Mouse, for he was her brother. And throughout the field mouse clan he was known as Charlie the Field Mouse, Storyteller and Singer Extraordinaire, for he was much beloved by one and all for his abilities in these areas, but especially by the littlest of the mice! Each night before bed, in the living room of Aunt Beatrice's burrow, the little mice would say almost in unison to Uncle Charlie, "A concert? By the corn? On our Farm?" And this was Uncle Charlie's cue to begin the story of the day's work, and his rendition of the Corn Concert. "Yes, a concert- on our farm!" Charlie would say to the little mice. "And when you are bigger, we will sit by the edge of the field together, and listen to the corn singing!" "Corn can sing?" the little mice would ask. "Sing it for us! Sing it for us! Oh, please, Uncle Charlie!" the little mice would chant. And Charlie, dutifully, would close his eyes, remembering all the autumn corn concerts he had known, and sing the song the corn sings each autumn evening at dusk, as the wind picks up and the twilight air begins to grow colder. Charlie would sing the corn's beautiful song to the little field mice each time they asked (which was, of course, every autumn evening!) in his richest field mouse, tenor voice. Start to tussle and to bustle! The song, the song of the corn! Call a truce to their labors. To rest from their gathering. And each time Uncle Charlie would sing the Song of the Corn in his beautiful Irish tenor field mouse voice, the little field mice who were too small to go to hear the Corn Concerts would close their eyes, and a peaceful look would be upon their faces as they listened to it. And when Uncle Charlie was finished, they would open their eyes, wide with wonder, having imagined what it would be like to hear the Concert of the Corn. After listening, they would say, "Oh, Uncle Charlie, we love that beautiful song you sing! When can we go to the Corn Concert? When can we go?" And Uncle Charlie would reply, "When you are grown, little mice, when you are big, then you will gather the golden kernels that the farmer leaves, the stray ears, and all the scraps from the field. And then at the end of a day of gathering you will assemble with the rest of the grown field mice to hear the Song of the Corn. You will become a part of this assembling of the mice, which has been called the Concert of the Corn by all field mice since time began. And then, Aunt Beatrice would always come in and say, "That's enough now, children. You've heard enough about the world of grown up field mice from your Uncle Charlie! Enjoy being a little mouse while you can, for when you are grown, there is ever so much to do! That's enough now! Off to bed! Time to let Uncle Charlie rest his bones. You know, it's not easy being a grown up mouse, and gathering the scraps of the field with the other grown up mice. There is little time to play, little mice, when you are grown! Off to bed, all of you!" And when the little mice were snug in their beds, Aunt Beatrice and Uncle Charlie would sit by the fire and rock. And Beatrice would knit with tiny little knitting needles, little socks, little blankets made of a special yarn which came from the silken tufts of the corn, a special yarn which Aunt Beatrice made into so many useful items. And while Aunt Beatrice knitted, Uncle Charlie would sit by the fire with her and smoke a special little pipe, made from a dried kernel of corn and a hollowed out leaf stem. This little scene was replayed many a night, and all was well in the burrows of the field mice. All was well, until one day, there were rumors among the grown up mice, rumors that soon things might be changing on the farm. The farmer was not having a good season. In fact, for several seasons, the farm had not done well financially. And just maybe, said the rumors, the fields would be sold to local builders to erect houses, stores and offices upon. And no more would be the golden corn. 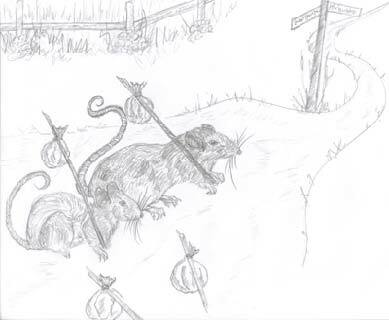 No more would exist the life the field mice had known!